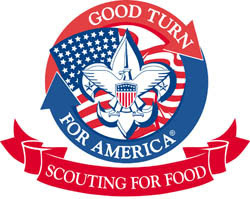 The Good Turn for America is a national call to service by the Boy Scouts of America to specifically address the issues of hunger, homelessness, and poor health in our nation- but also applies to service throughout our community. To address these issues, the BSA is collaborating with some of the most respected service organizations in the nation; The Salvation Army, the American Red Cross, Habitat for Humanity International and hundreds of local charities to provide volunteer opportunities for youth and adults to fight hunger, provide shelter, and teach the habits of healthy living. is the largest one-day food drive in the Boy Scouts of America. Scouting for Food is a local tradition with the Cub Scouts. We went from door to door asking people to donate food for the food banks. It is always just before Thanksgiving. ***** . Thanksgiving USA . ***** . Pinewood Derby .